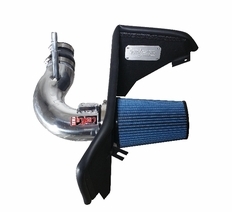 The Injen Short Ram Intake System is a traditional, underhood intake system that is placed in the stock location of the factory airbox system. Existing sensors will bolt directly to your new Injen intake system. a heat shield is included that is both functional and stylish. Impressive gains of 26 HP and 26 lbs. TQ at the wheels!Even better, this item is backed by Injen's lifetime warranty. New Level Motorsports is an Injen Direct Authorized dealer. The Part number for this item is: PF7017P or PF7017WB (depending on your color choice) and it fits 2016-2017 Chevy Camaro (2.0 Turbo Models). Ever worry about water getting into your cold air intake system? For that added protection during those unsure moments, Injen Technology's HYDRO-SHIELD PRE-FILTERS are race proven material manufactured from highly durable polyester. Uniform micron openings allow the filtering of debris .005 or larger. The HYDRO-SHIELD PRE-FILTERS are factory treated using an embedded hydrophobic process, which offers consistent airflow, water repellency and maintains horsepower gains. (Please note that this item is water repellent, not water proof).